Scrapbook Savvy: Happy 80th Grampa! Another busy weekend, following a busy week... sometimes in the summer it seems like you don't have time for anything, because there's so much going on. You just have to get from wedding to shower to reunion and back to work without forgetting anything! While it's busy, we are having fun. 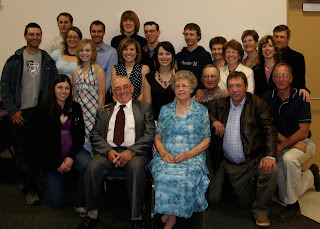 We had a great weekend with my family, celebrating my grampa's 80th birthday! His actual birthday was in January, but we thought we'd celebrate when it was nicer.... Yep, so of course, it's been raining for the last two weeks. It's not perfect, but the farmers in the family were happy. They didn't have to be worrying about what they should be doing, so they could just enjoy. We had a fun family get together Saturday night, which was so great. We had a big potluck and played pool and visited. Then on Sunday, we had an afternoon tea type party and sooo many people showed up! I would guess about 250 people showed up! Really goes to show how great he is and how lucky we are. Plus, we had almost the entire family together for a family photo, which was fabulous. It rarely happens now that we're all spread out. Thanks Aimee for the tip on finding Greys, I'll check it out. God bless Grandpa, what a lovely family he has....I love family photos.